Since my pregnancy is coming close to the end, I started reminiscing about it. I have been so lucky to have such an easy pregnancy, which allowed me to stay fit all along. As I look back, I did do a lot of things as far as fitness goes. 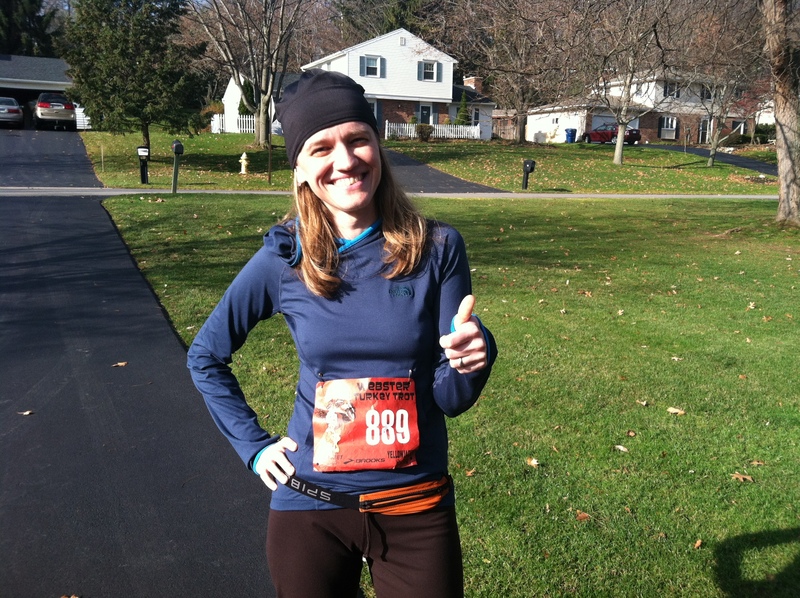 I ran my first race when I was a little over a month pregnant in the Webster Turkey Trot. That was definitely an experience in itself. I did enjoy it more since I ran it with my sister. I told my sister that I was pregnant that same weekend and I remember her saying that she felt bad that she pushed me to keep going. HA! I kept running for quite a while after that, since it was a fairly mild winter. Unfortunately at about 21 weeks, I had to stop running since my legs and feet hurt. I guess my legs and feet could not handle the extra weight that I was carrying. 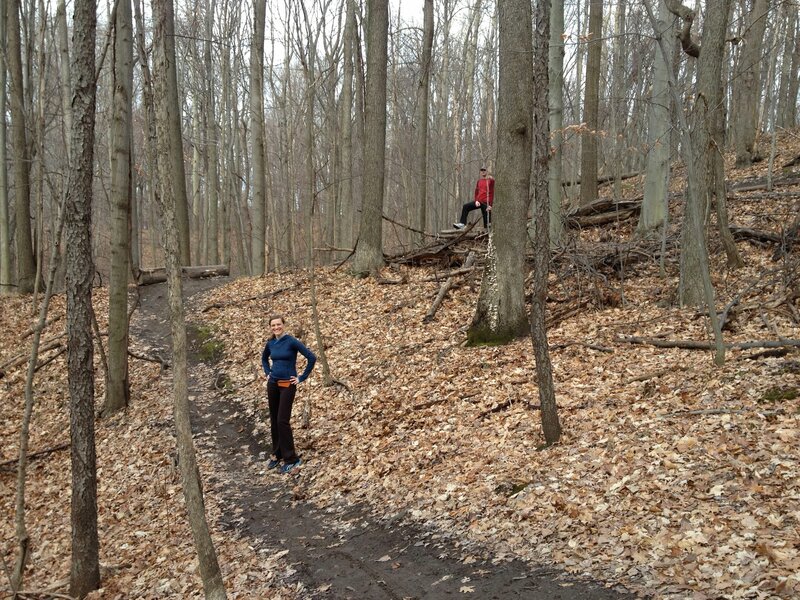 I tried trail running, but that did not feel any better. It was fine though, since there were other activities that I could still do. During the winter months, Joel started to rock climb indoors. I decided to join him one day. We went to the Red Barn at RIT. Most of the climbing there is bouldering and not wall climbing. That part was a little better since I could not really wear a harness. It was definitely fun, but my belly kind of got in the way. 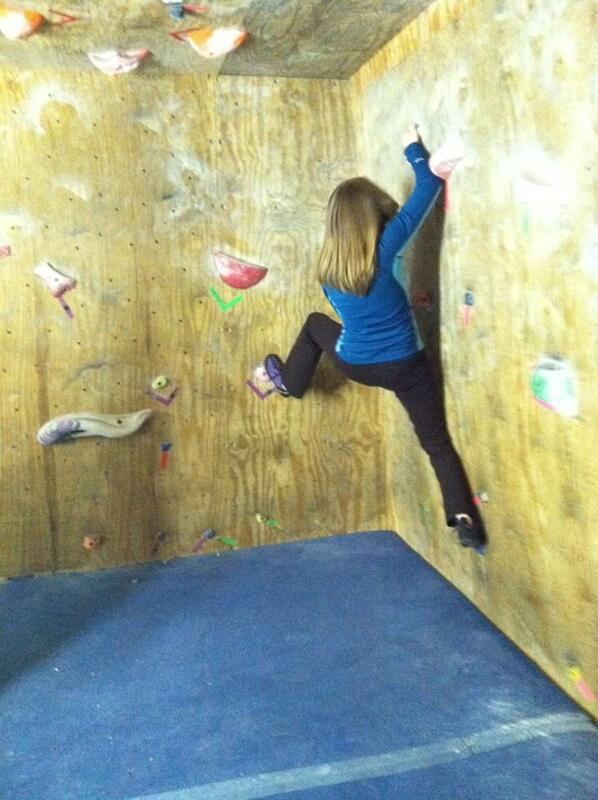 :) Bouldering requires you to be close to the wall to keep your balance. Since my belly was sticking out, I could not really do that. HA! I did have fun, nonetheless, but I realized that it was not a good idea to keep it up. Climbing at the Red Barn (16 weeks pregnant). Cross country skiing was another activity that I did during the winter months. Although we did not have much snow this winter, I did manage to get out at least 4 or 5 times. The place to be this winter was at Bristol Mountain, since they made the snow for the cross country ski trails too. Even though the trail was not too long, it was still fun. I was lucky enough to have a few friends come with me, which made the outing more fun. 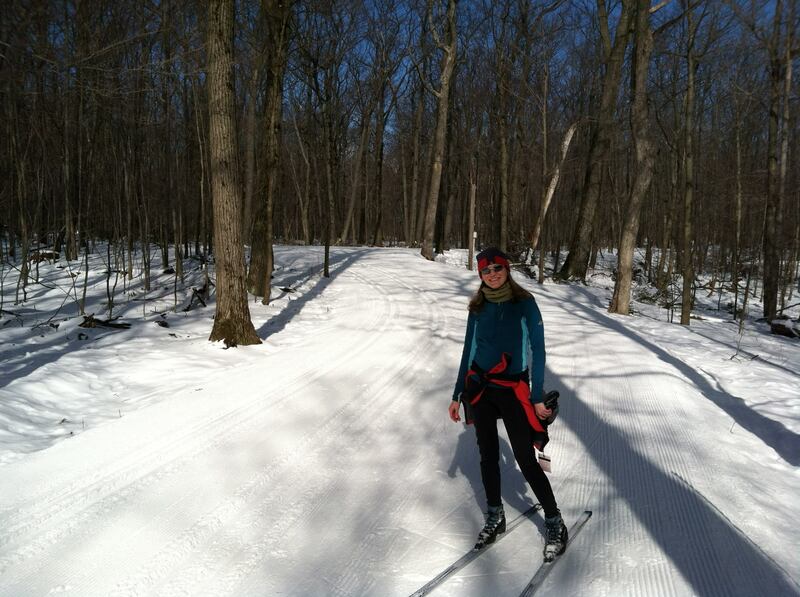 Cross country skiing at Bristol Mountain (17 weeks pregnant). Once the warmer weather arrived, I started to bike again. There were actually a few times that I was able to ride in March due to the warm weather. 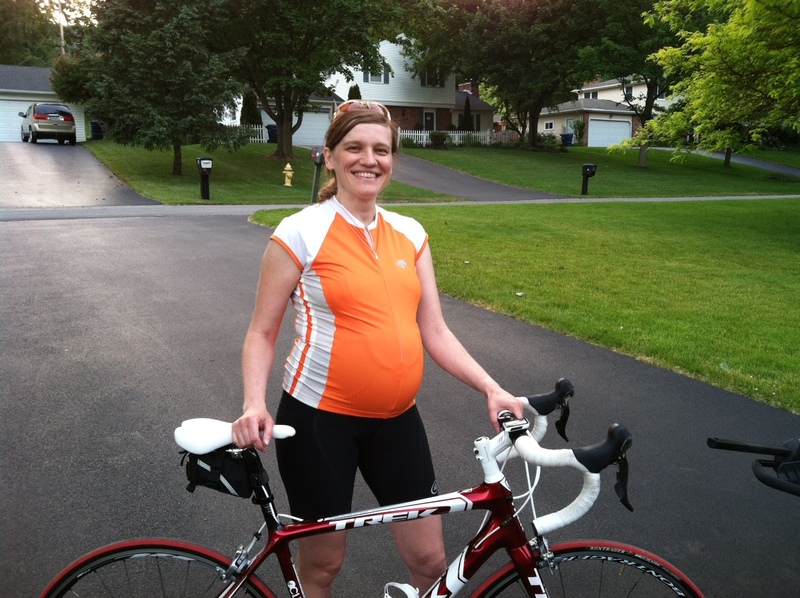 I was able to ride a fair amount throughout my pregnancy. However, the closer I got to the last few weeks of my pregnancy, the more uncomfortable it got. I also felt tired more easily. The last ride that I did was at 34 weeks. That was pretty good in my opinion. 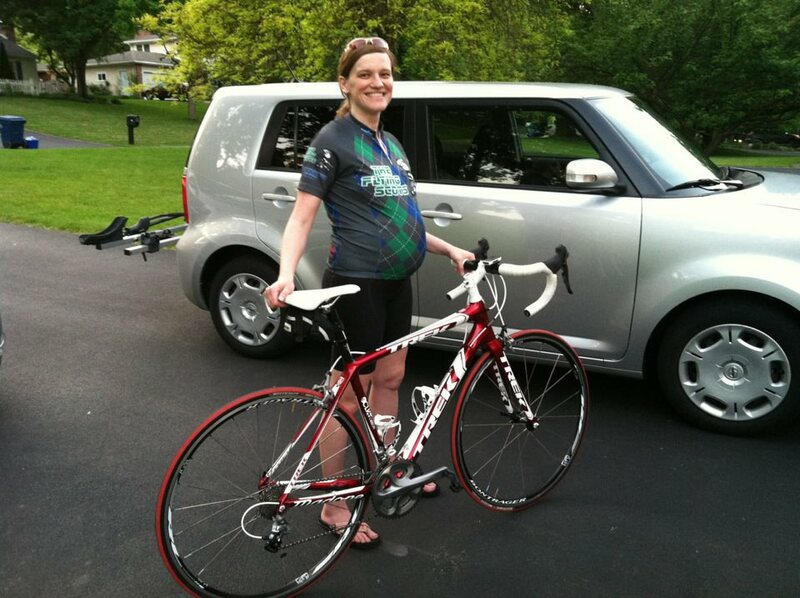 :) I felt lucky to be able to ride at all, especially as I was getting closer and closer to the end of my pregnancy. I was also lucky to have Joel and my friend Jane ride with me, since I did not think that riding by myself was a good idea. The miles went from 24 miles to 9.5 miles. It was interesting to experience the effects of pregnancy on my riding. The fact that your hips change greatly affects the sitting bones. The outcome is an uncomfortable saddle. 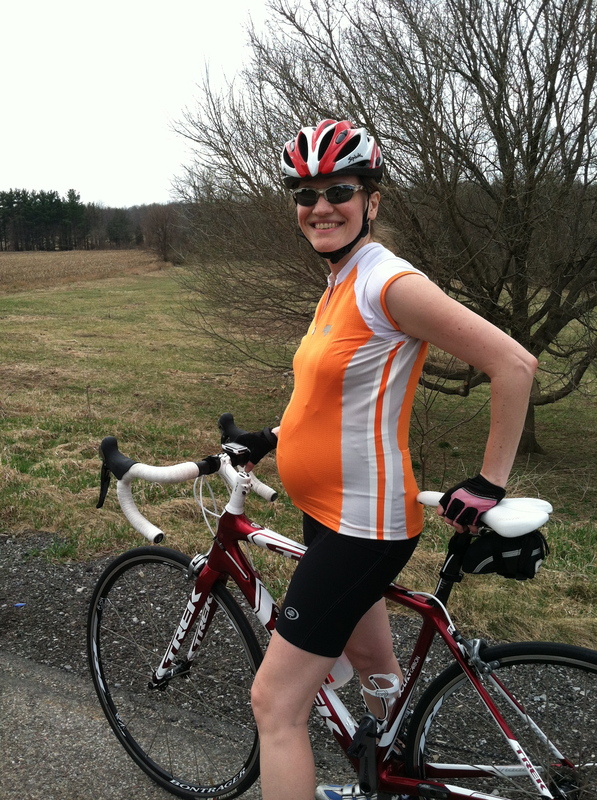 Also, as my belly grew, I could feel it more and more while pedaling. That part was not uncomfortable, but I felt bad for hitting the girl with every pedal stroke. She probably did not appreciate that too much. :) It was also interesting how easily tired I got. This was even more noticeable during the rides that I did closer to the 34th week. I could only tolerate about 45 minutes of riding by that point. I must admit that I was a bit sad to give it up, since I really love cycling. But I am sure that I will be able to ride soon after the girl arrives. After the ride (31 weeks pregnant). I started taking a yoga class before I found out that I was pregnant. I think that the class has been helping a ton. I am always relaxed due to it, since the class is a restorative class. The poses have changed a bunch throughout my pregnancy. I no longer can lay on my back, among other things, and most of the poses are very supportive. Nevertheless, I still feel great after every class, so it is definitely beneficial. We have also been practicing breathing a bunch, which is good no matter what. I also think that the class has helped keep my balance intact. Everyone mentioned to me how pregnancy causes your balance to be off. That was not the case for me at all. I wonder if cycling helped with it as well. Aside from all the activities that I mentioned above, walking and hiking was something that I always did, since they were tame on my legs and feet. I was lucky to have my friend Kristin join me a fair amount of times. I remember a couple of times we decided to go for a run, but then it turned into a hike or a walk. She has been super supportive of my changing body and abilities. We were always just happy to enjoy the outdoors and chat (of course!). :) Mendon Ponds Park, the Crescent Trail, and Dryer Road Park have been my favorite spots to hike. The canal has been a good spot for walking. Hiking at Dryer Road Park.